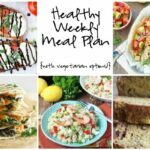 Another week, another group of delicious, nutritious recipes to make your life just a bit easier! I don’t know about you guys, but I sure did enjoy my holiday weekend last week. We went to the beach with friends and to our pool club with friends (we had NO BASEBALL for 3 whole days!) and it was amazing. But what does amazing actually mean? Lots of food and drinks. I don’t regret it one bit. I had a great weekend. But it’s hard to get back on track. Am I right? I never stopped my running and bar method classes, I just need to be more conscious of what I am eating. I just feel better when I eat healthier. Bottom line. I will never give up my wine and treats. Ever. Most of you know I am all about moderation. That’s such a broad word though, what does it really mean? I focus on fueling my body with wholesome, nutritious foods as much as possible(about 80% of the time) and I still enjoy my not-so-healthy indulgences (for me that’s a couple glasses of wine on the weekend and some type of dessert). I don’t want to be that boring person at the party eating carrot sticks. I want to be the girl enjoying herself. I don’t believe in deprivation. 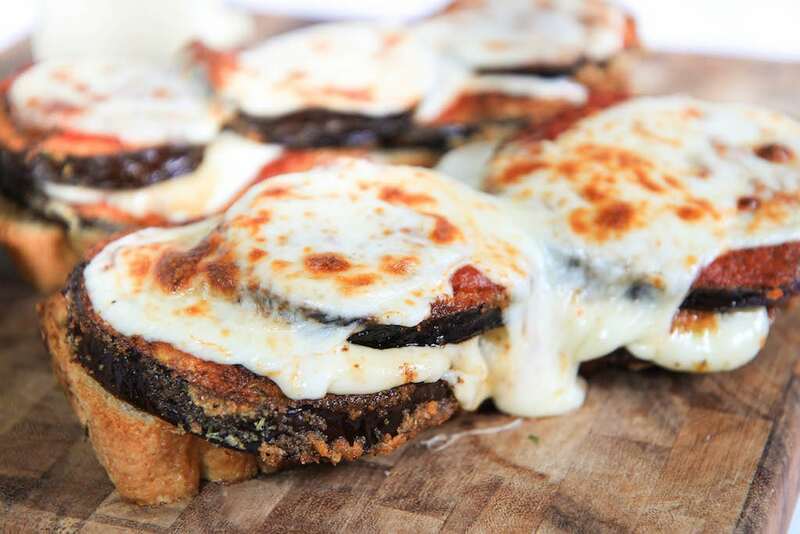 Open Faced Eggplant Parmesan Sandwiches from greens & chocolate. Prep Ahead: There’s really no need to prep ahead for these. Serve with more grilled veggies for an easy no-oven meal! 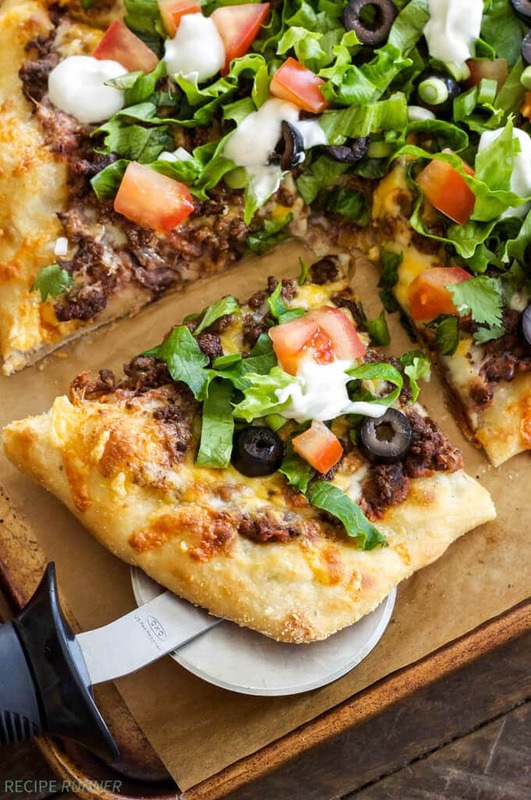 Taco Pizza from Spoonful of Flavor. Vegetarian option: You can omit the ground beef, use tofu instead or increase the amount of veggies. 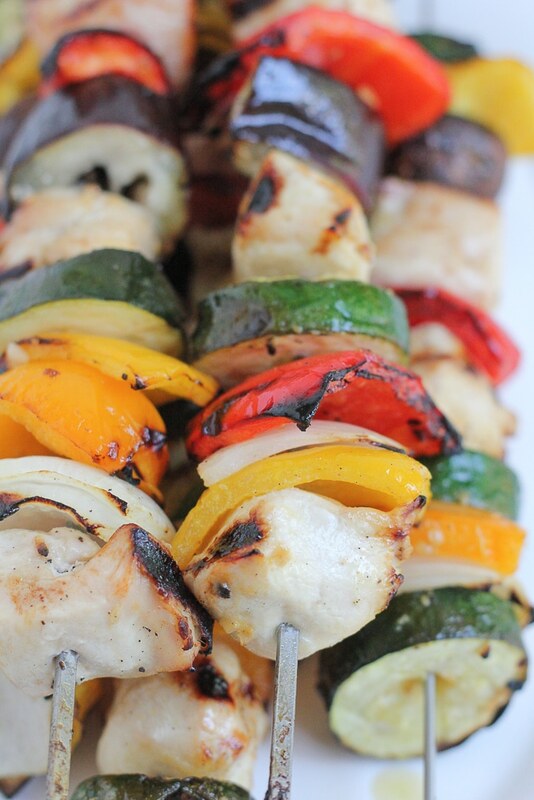 Grilled Chicken Kebabs from Hip Foodie Mom. 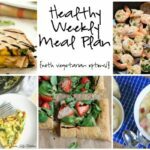 Vegetarian Option: Skip the chicken and just load on more veggies! 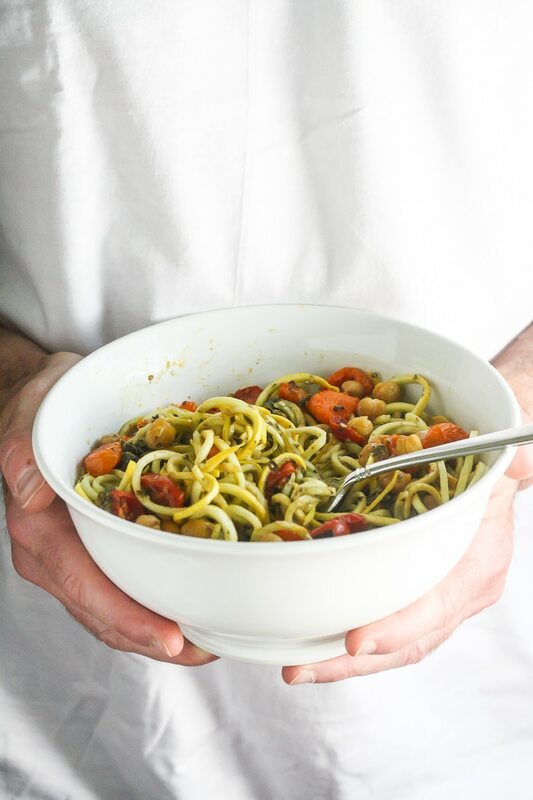 Squash Noodles with Kale Arugula Pesto and Roasted Chickpeas from Lauren Kelly Nutrition. 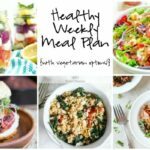 This recipe is already vegan! Shaved Asparagus Ricotta Flatbread from Flavor the Moments. Prep Ahead: The pesto sauce and shaved asparagus may be done in advance. 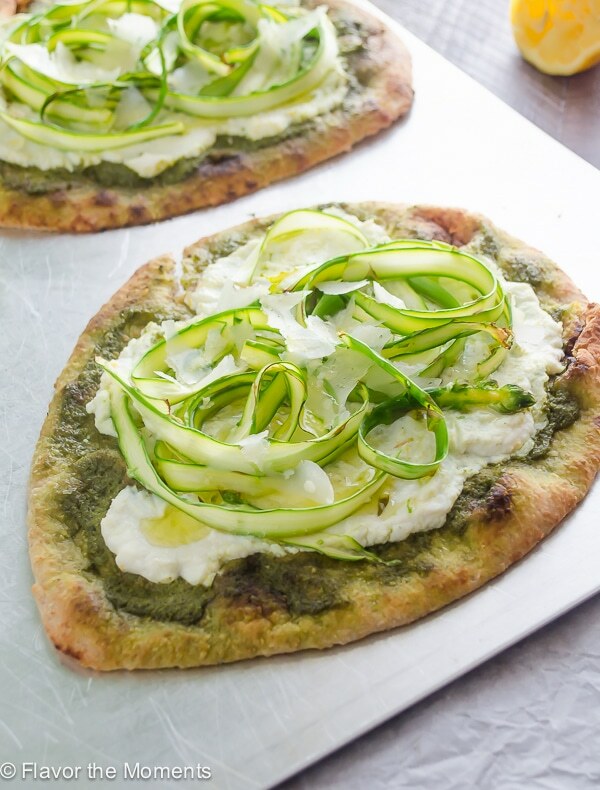 Pesto and asparagus on flatbread? That has my name all over it! Let’s not forget my beloved grocery list. This is such a lifesaver. So tell me, was are you making first? Have a great week! Boy, am I in a dinner rut. I need this this week, thanks! Again, you picked some stunning meals! 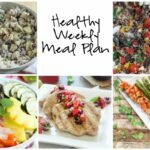 I definitely need some inspiration… we’ve been eating a ton of salad (good!) but I’m ready for a heartier meal this week. Thanks for collecting such terrific recipes! I’m definitely inspired (and hungry)after checking out these dishes here today! I’m totally partial to the eggplant sandwich!! Taco pizza? Man! It is like you know me! I could throw that on the grill and call it a day. I’m with you! No matter how healthy I try to eat, I can’t give up my treats forever! That would make like so sad! So glad you had a great holiday weekend! Ps. LOVE that Taco Pizza! Love those kebabs this week and I’m really a lover of eggplant so oh my that sandwich looks fantastic! 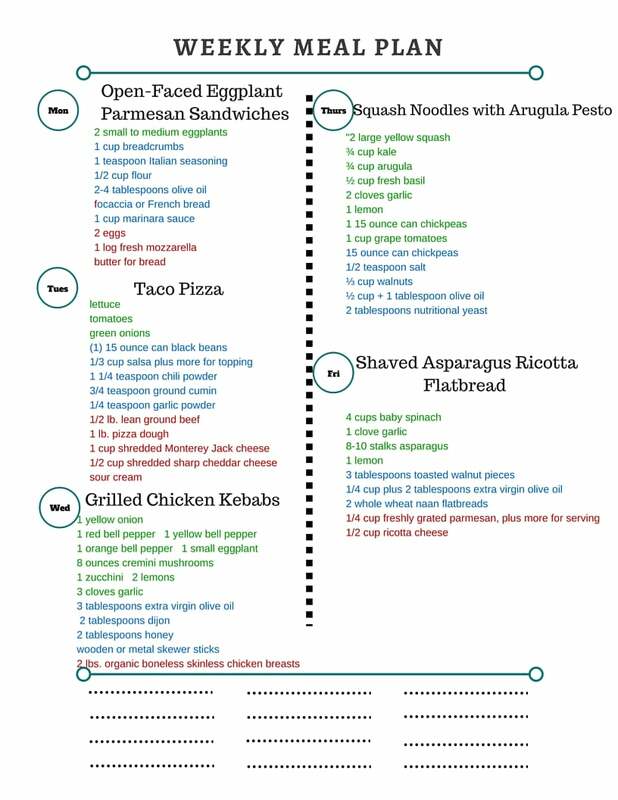 I so need to be better at meal planning. Lately it seems like with summer, all meal planning has been tossed out the window and it’s a peek at the pantry and fridge going “I dunno”. 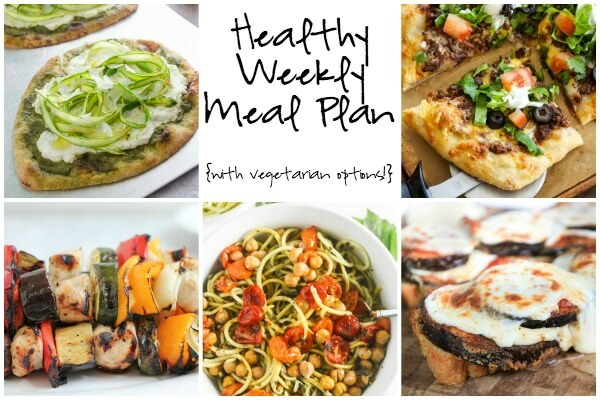 Thank you so much for the inspiration – I need to make that taco pizza ASAP! I love your view on balance and moderation… on point, sweet friend! I think I’m going to start with your squash noodles and kale pesto —- yum! They all look so delicious. I think I’ll start with the open-face eggplant Parmesan sandwich.